No one knows how the dinosaurs rose to dominate the planet, but the answers may lie within the mysterious End Triassic mass extinction that wiped out their competition. Experience what it’s like in the field with the mass extinction detectives at Methods, From Science Friday. If you stood in southeastern Utah over 300 million years ago, you’d be overlooking the ocean. The landlocked state wasn’t quite the same landscape of scarlet plateaus and canyons you might see today, but a coastal desert where sand dunes butted up right against the sea. And about 80 million years later, it was home to some of the earliest dinosaurs. 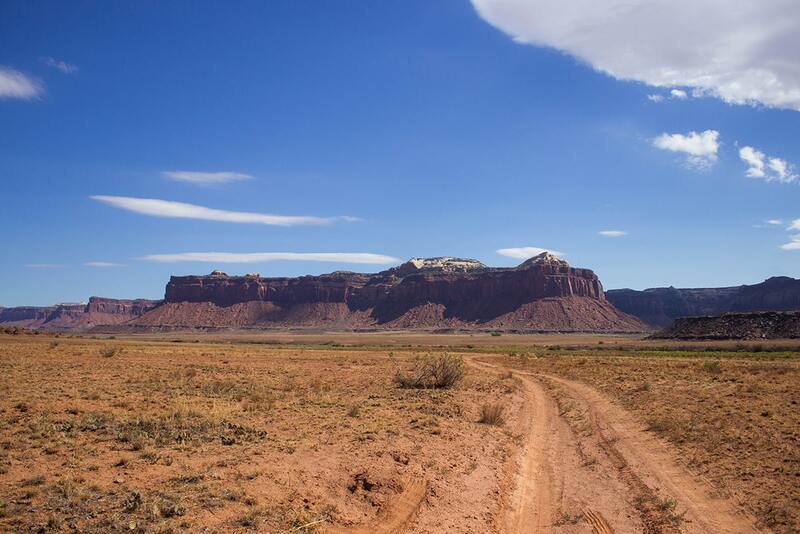 \In this region of Utah, today known as Indian Creek in Bears Ears National Monument, the remains of dinosaur relatives, known as protodinosaurs or “dinosaur aunts and uncles,” are buried in the Earth. Their bones tell the stories about the dawn of dinosaurs, prehistoric Utah, and a much warmer Earth. The creatures that came before the massive, iconic dinosaurs of the Jurassic period are often times overlooked. But the fossils of early dinosaurs and animals provide equally crucial information for filling in Earth’s early timeline. There is a bounty of amazing fossil diversity dispersed across the Indian Creek sites, from the crocodilian-like phytosaur and the big armored herbivore aetosaur to the fan-backed dimetrodon. 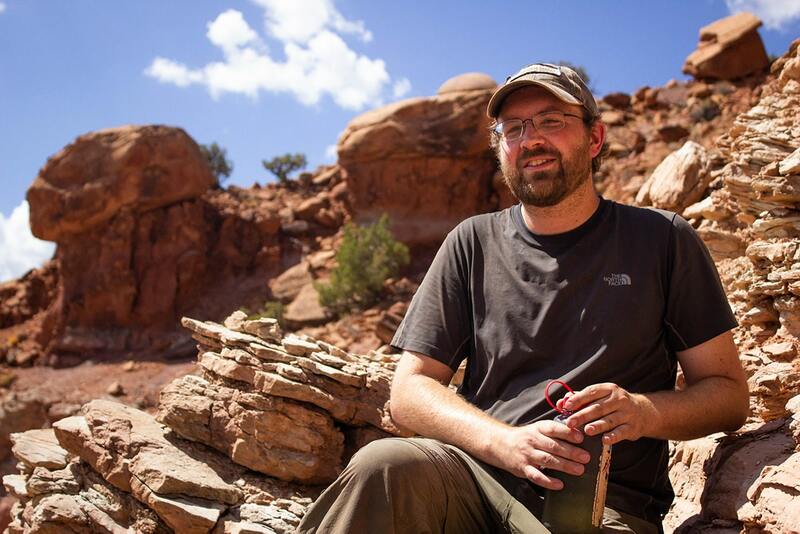 In this interview, recorded live at Salt Lake City’s Eccles Theater, paleontologist Randall Irmis gives Ira an inside look at what it’s like to step into a paleontologist’s boots and discover some dino gold. You can view video and photos from Science Friday’s desert dig, listen to an audio feature about the mystery of the death of the phytosaurs, and explore more about mass extinctions with Irmis and his team at Methods, from Science Friday. IRA FLATOW: This is Science Friday. I’m Ira Flatow, coming to you from the Eccles Theater in Salt Lake City. Last time we came to Salt Lake City we talked a lot about Utah’s dinosaurs. So this time we had to up the ante. We decided to turn two of our staff into paleontologists. Before we arrived here in Salt Lake, we sent producers Lauren Young and Katie Hiler out into the field with our past guest Randy Irmis. And they discovered what it was like to be paleontologist for a day. And it was no walk in the park, as you will see. KATIE HILER: Not even 15 minutes into this fossil hunt, and I’ve lost my guide. Paleontologist Randy Irmis is leading two of his team members up into the hills of southeastern Utah to excavate a Phytosaur skull they found just a few days ago. RANDY IRMIS: If you think about a skeleton of any animal, there’s only one skull, but there’s many ribs. There’s many vertebrae. There’s two of each type of limb. So you don’t find a lot of skulls. So that’s always really exciting. KATIE HILER: Randy manages the slippery steep climb up to our dig site like a seasoned desert hiker. My colleague Lauren and I have to move a little less quickly. KATIE HILER: No, I got ya. We’re here? ANDREW MILNER: So you’ve got the animal hanging upside down. KATIE HILER: That’s Andrew Milner, the second paleontologist in our group. The long crocodile-like skull of Phytosaur is still mostly buried in the rock. Only the roof of the mouth is exposed. ANDREW MILNER: It’s a pretty good-sized skull. So we have a lot of rock to remove. KATIE HILER: Randy and Andrew pick up their brushes and rock picks and set to work. But up here on this narrow cliff ledge there’s only so much room to move around. So they give the seat of honor to our third party member, the guy who found the Phytosaur skull in the first place. CODY ROCK: I’m Cody Rock, and I deliver pizzas for a living. KATIE HILER: Yep, it’s not just professional fossil hunters on this dig. If you happen to have the right stuff, you can join Randy out in the field as a volunteer. CODY ROCK: Figure it’s kind of crazy to think that I got to come out here and get karma points for digging around for bones. That’s a cool one. So everything I’ve learned from this stuff, especially in these areas, has all been from this place, just coming in here and getting exposed to it. ANDREW MILNER: This is the side of the head right here, and then the long snout. And we figure the end of the snout will end about here. –Andrew breaks out the rock saw, which he uses to separate the hunk of rock with the fossil in it from the rest of the cliff face. ANDREW MILNER: Now we can get a nice plaster jacket around the end of it, because it’s kind of a rough ride down the hill. Hopefully, not too rough. RANDY IRMIS: We are cutting burlap into strips that we’ll then dip into the plaster. ANDREW MILNER: You try and put the big jacket together, and next thing you know somebody’s sloughing plaster on somebody else. And then the [INAUDIBLE] returned. And next thing you know, there’s people flinging plaster. RANDY IRMIS: And then it gets in someone’s long hair. ANDREW MILNER: Yeah, and it’s really a mess. KATIE HILER: The excavation process can take a few days, so before a plaster fight breaks out, it’s time to drive back to camp. We leave the fossil jacket to dry overnight, and head back down the hill. RANDY IRMIS: Just be careful. There’s lots of slippery rocks that act like ball bearings. So just make sure you have good footing. KATIE HILER: From what I can tell, a lot of what you do is grunt work. All that rock slamming today, and the cutting. RANDY IRMIS: Yeah, I mean we do joke that there’s a lot of people out there who are into the idea of paleontology. But once they see the real hard work, it’s a lot less sort of romantic. IRA FLATOW: Now as you have seen, Utah is famous for its dinosaurs. And we just heard about Randy and his team uncovering the skull of a 200-million-year-old Phytosaur. It’s a long crocodile-looking animal that’s actually not related to crocs or dinosaurs. So what is it? Joining us again to share more about the discovery is Randy Irmis, curator of paleontology at the Natural History Museum of Utah, professor of geology and geophysics at the University of Utah. Welcome back to Science Friday. RANDY IRMIS: It’s a pleasure to be here again. Thank you. IRA FLATOW: Now as we saw, you guys ended up carrying the Phytosaur’s skull down that steep hill a few days later. And was it a rough ride, like Andrew said in the piece? RANDY IRMIS: Yeah, we can’t drive anywhere that there aren’t roads. So we have to carry everything out by hand. And some of the smaller pieces we could put on frame packs and carry out. But the large one was over 300 pounds. And that’s four people carrying it on a medical backboard for three hours about. IRA FLATOW: How does your back feel today? RANDY IRMIS: It’s recovered. My knees were actually the ones that were really kind of sore afterwards. IRA FLATOW: So if a Phytosaur is not a dinosaur and it’s not a crocodile, what is it? RANDY IRMIS: Well, it’s a reptile. But it evolved before the common ancestor of both dinosaurs and crocodiles. And it was only alive in the late Triassic period, between about 235 and 200 million years ago. IRA FLATOW: That was just the beginning of right before dinosaurs came on the scene. RANDY IRMIS: Yeah, the very beginning of the age of dinosaurs, which is why I find this time period so exciting. IRA FLATOW: It’s interesting, that really long snout. How many teeth did one of these animals have? RANDY IRMIS: Well, you certainly wouldn’t want to run into one in a Triassic river or stream or lake. I’ve brought here a cast of one of the lower jaws of a Phytosaur. And I don’t know. You can see how slender the snout is. The tip of the snout is up here. And hopefully you can see all these little tiny holes. And all of those would have been filled by teeth when this animal was alive. IRA FLATOW: It’s about two feet? Or a little more than two feet long? RANDY IRMIS: That’s right. And it’s not even complete. It would have another foot added on to it. RANDY IRMIS: Oh, easily a couple hundred in the entire jaws of the animal. IRA FLATOW: And so how big is the whole animal compared to that two-foot length? RANDY IRMIS: This particular individual probably was about 15 feet long. But we have skulls of Phytosaurs that indicate they got up to about 30 feet long. IRA FLATOW: Wow. Wow. Huh! I have to recover from that one. Is it related to anything that’s around, or similar to anything around today? RANDY IRMIS: It doesn’t have any direct descendants that are alive today. But it certainly would have acted like and lived a lot like a modern-day crocodile. IRA FLATOW: So with those teeth, it ate what a crocodile today would be eating– other animals? RANDY IRMIS: Yeah, and an animal like this that has this really slender snout is eating lots of small fish and other aquatic prey. Other things that have more robust snouts could have gone after larger prey, like early dinosaurs. IRA FLATOW: It could have eaten an early dinosaur? RANDY IRMIS: Oh, yeah. Dinosaurs at this time were at the bottom of the food chain. And they were just the little things scurrying about. IRA FLATOW: It was small ones. IRA FLATOW: So how many Phytosaur skulls have we found? RANDY IRMIS: There’s several hundred worldwide. But we don’t have very many from Utah. And particularly in the area where we’re working, we just have just a few, because we’ve been working there for about five years. And so it was really exciting to find another complete skull just a few weeks ago. IRA FLATOW: Now in the postcard we heard from Cody, the guy who found the Phytosaur skull– the pizza delivery man. Do you have a lot of pizza delivery men who get on your digs and help dig up– or people like them? Can just regular folks go and do this? RANDY IRMIS: As far as I’m aware, he’s the first pizza delivery man we’ve had. But we have people from all walks of life that volunteer with us at the museum that come out on digs, and also prepare the fossils back in the lab– that is, removing all the rock from around them– and working in collections. It’s incredible. And the best part of my job is interacting with our volunteer. IRA FLATOW: All right. Let’s talk about people in our audience, and people who are listening to us, if they’d like to become a volunteer. Do you need the right stuff to do this sort of thing? RANDY IRMIS: Well, you certainly need to be able to deal with the elements, as you saw, and hike long distances, and camp. But we train everyone. We do training courses. And so you don’t need to come in with any prior knowledge of paleontology. You just need to have a passion for it. IRA FLATOW: That’s great. Let’s go to the audience right here. SPEAKER 1: Hi, Thank you. I was hoping to ask two questions. When you are extracting a specimen, how do you know when to stop removing rock or surrounding material, and how do you know when you’ve reached the specimen? Because I imagine it looks similar. RANDY IRMIS: Yeah, that’s a wonderful question. We are lucky that in most cases, the fossil bone has a little bit different texture and color than the rock around it. But it’s this delicate balancing act of exposing enough of the fossil to tell what it is, what type of bone or skeleton it is, and how it’s oriented; but leaving enough rock around it to support it so we can get it back to the lab in one piece. And most of the time, because we’ve spent a lot of time looking at these fossils, we have a good sense of how they’re oriented. But we can get it wrong sometimes. But that’s why they make glue. IRA FLATOW: And we’re glad that they do. Let’s go to this gentleman here. Yes, sir. SPEAKER 2: Can kids volunteer? RANDY IRMIS: We have volunteer programs that involve folks under 18 at the museum. For basically safety reasons we don’t have a volunteer program in the field yet. But there are other opportunities at other museums that allow that. IRA FLATOW: What if he brought his parents along? IRA FLATOW: Got to talk your parents into it. IRA FLATOW: You can do that. Yes, we have another question up there at the mic. Yes, go ahead. SPEAKER 3: Do you know how much, what they eat, these Phytosaurs? IRA FLATOW: You ever find anything in their stomachs, or anything? RANDY IRMIS: Oh, great question. Yeah, so the worst part is that the name is totally misleading. “Phyto” means plant, so it means “plant lizard.” But these were definitely carnivores. These were meat eaters all the way. And we do have a couple of examples where they found stomach contents of various small lizard-like reptiles and other things in the stomach. And we find a lot of their poop as well. Fossilized poop is called coprolites. The good thing is, unlike the modern poop we talked about with the living dinosaurs out in the Great Salt Lake, it doesn’t smell. And we see from their poop, they ate a lot of fish, because there’s tons of fish scales in it. IRA FLATOW: Do you think people out just who are going hiking, like I’m going to go hiking, and among the rocks that we pass these things every day, and just never know that they’re fossils? 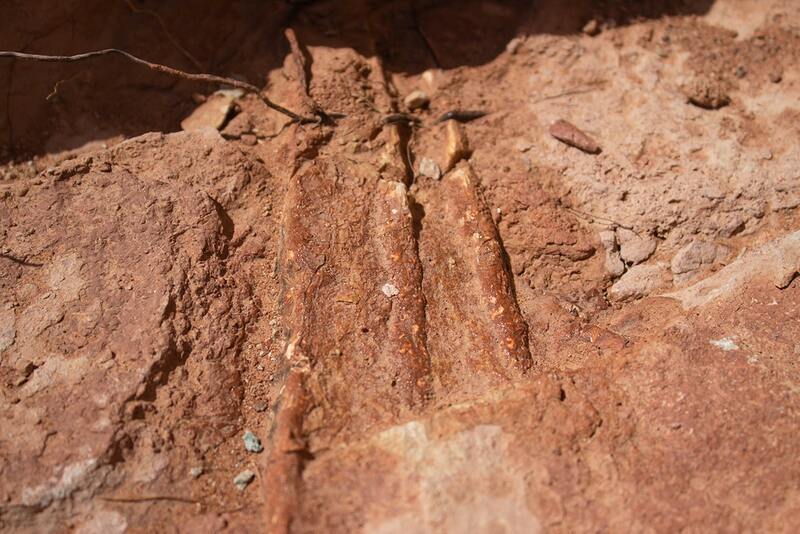 RANDY IRMIS: Certainly you walk past fossils all the time out in Utah. And some of them are very recognizable, like a shell or a complete bone. But a lot of them are very modest looking. They’re just tiny fragments on the surface. And it’s just a matter of eye training, getting to recognize those. IRA FLATOW: Over here, yes. SPEAKER 4: How can you tell if you’re just walking by if it’s a rock or a fossil? And if it is a fossil, how can you tell how old it is right off the bat? RANDY IRMIS: Well, we have a very scientific way of telling that it’s fossil bone, which is to lick it. I’m not joking. I’m not joking. That’s really true. IRA FLATOW: Wait a minute. Wait a minute. IRA FLATOW: You lick it. IRA FLATOW: I don’t see that on National Geographic, or any of those. RANDY IRMIS: Well, maybe their shows would be more popular if they showed that. No, this is not a fib. Rock typically does not stick to your tongue. But fossil bone generally does. And I haven’t gotten any diseases, I don’t think, so. This could go in so many directions. Is that really? That’s something that the standard test. RANDY IRMIS: It it. It is. And there’s actually multiple different types of taste tests in geology and paleontology. IRA FLATOW: [INAUDIBLE] what do you mean? Well, now we’re into this. RANDY IRMIS: So one of the things that you want to know about in geology is whether the sediment was deposited by fast-moving water or slow-moving water. And the finer grain the sediment, the slower the water was. And when you get down to really fine-grained sediment, you can’t really see it with the naked eye, or even with a little hand lens. So to tell the difference between mud stone and silt stone, you bite off a little piece and grind it between your teeth. And the mud stone will be very smooth, sort of like a milkshake you get at a fast food place, because they actually put clay in those; and then the silt will grind a little bit and be a little gritty. So. I’m not going to ask about the coprolites. RANDY IRMIS: They do stick to your tongue as well sometimes. IRA FLATOW: OK. Did the Phytosaurs survive that great die-out beginning the Triassic period that heralded the dinosaurs? RANDY IRMIS: Yeah, the Triassic period is bookended by two mass extinction events. And at the very end of the Triassic, this mass extinction really resulted in the final rise of dinosaurs. But Phytosaurs, although they were super successful for 30 million years, they didn’t make it through that. And that’s why they don’t have any descendants today. IRA FLATOW: And you’re really interested in this Triassic period. What draws you to this? RANDY IRMIS: Well beyond sort of the origin of dinosaurs, which I think a lot of people find really cool, and there’s all these weird and wonderful creatures that evolved in the wake of the first mass extinction at the beginning. But also from sort of understanding our own world, this is a time when we had high carbon dioxide levels in the atmosphere. And in fact, this mass extinction was probably caused by massive release of greenhouse gases. So if we’re interested in where we might be going as the Earth warms, we have to go far back in time to times like the Triassic to understand that. IRA FLATOW: Well, I hope we’re not headed for a mass extinction, in all seriousness. RANDY IRMIS: I hope not either. There’s still time to change our ways. IRA FLATOW: We’ll go here first, and then we’ll go down here. Yes, over here. SPEAKER 5: So I don’t know how you extract the DNA from that? And I was wondering how you do that, because it gets encased in rock? RANDY IRMIS: Unfortunately with fossils this old, we can’t extract any DNA as of yet. They’re over 200 million years old. But there are fossils that are much more recent that are tens to hundreds of thousands of years old where people are able to extract DNA. And for the most part, those are preserved in sediments that haven’t turned into rock yet. So it’s a bit easier. But we do get proteins and other complex organic molecules, like pigments, that sometimes do get preserved in rocks this old. IRA FLATOW: All right. Let me go to this side of the audience. Yes, sir. SPEAKER 6: Why does it stick to your tongue, the fossil? IRA FLATOW: You see, you’ve created a whole new generation of scientists. RANDY IRMIS: I really hope so. RANDY IRMIS: Yeah, although most of the pores in the holes in the bone have been filled by rock and mineral, there’s a few left that have spaces. And so that provides just a little bit of stickiness and surface tension to stick to your tongue. Because of the moisture on your tongue. IRA FLATOW: I love it, Randy, when we go in directions I never anticipate when we started. I want to thank you for taking time to be with us today. Randy Irmis, curator of paleontology at the Natural History Museum of Utah. IRA FLATOW: Professor of geology and geophysics at the University of Utah. Once again, thank you for being with us today. IRA FLATOW: That’s about all the time we have. Our heartfelt thanks to Maria O’Mara, Gail Ueuer, Elaine Clark, Doug Fabrizio, Kelsey Moore, and all the great folks at KUER NPR Utah for hosting us. SPEAKER 7: Thank you, guys. IRA FLATOW: And thanks to the amazing staff at the Eccles Theater for making this wonderful evening possible, and the George S and Dolores Dore Eccles foundation. And thanks to all our Science Friday staff. It does take a lot of people behind the scenes to run this ship, as you have seen tonight. Oh, and let’s give one last round of applause for The Boys Ranch. They’re going to play us out tonight. Thank you for coming. Salt Lake City, Utah. I’m Ira Flatow. Drive safely, all. Have a good night.